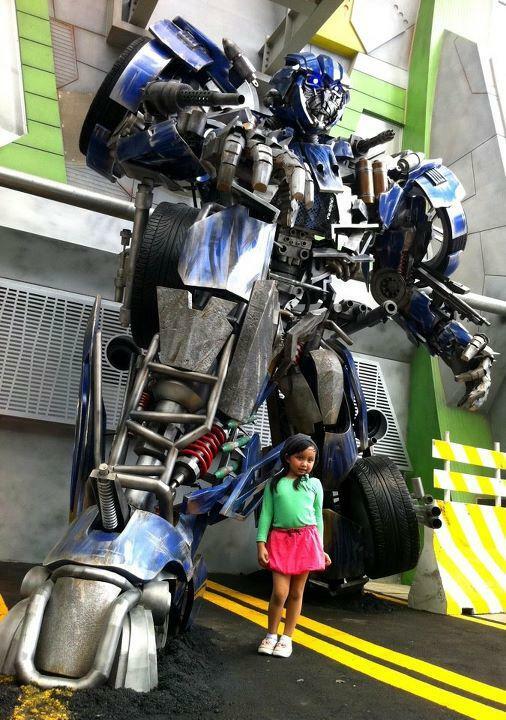 Transformers: the Ride will premiere in just a few days at Universal Studios Singapore. As a result regional news stations are airing reports (below, in English for some reason) from The Ride that shows off more of the footage from the attraction, including various areas and a nice long look at the Evac vehicle that people will be sitting in for the five minute simulation. What is amusing is how you have three different stations (but maybe owned by the same corporation) airing the same reports with the same reporter but edited in slightly different ways to make it seem different. Speaking of Evac, it turns out that the attraction has a life size statue of the character sitting outside, perfect for quick mementos of the visit. I assume the Hollywood version of The Ride will have the same thing. Thanks to Feris for finding the video. The second video comes from Resorts World Sentosa that provides a few details about the attraction. They verified that Michael Bay did consult on the attraction and footage verified that Optimus, Bumblebee, Sideswipe, Wheelie, Megatron, Ravage, Sideways, Grindor, Devastator, Bonecrusher, and Starscream all make appearances along with various voice actors reprising some of their roles. Does anyone know the name of the actor who voices EVAC? I've been searching the web with no results. IMDB has nothing listed (though not usually 100% worthy). Any idea who TFLAMB? Perhaps you haven't been to Singapore before...but, English is the most common language spoken there. The news stations are regional and most are owned by the same media corp. Hence, the same reporter for the various channels.